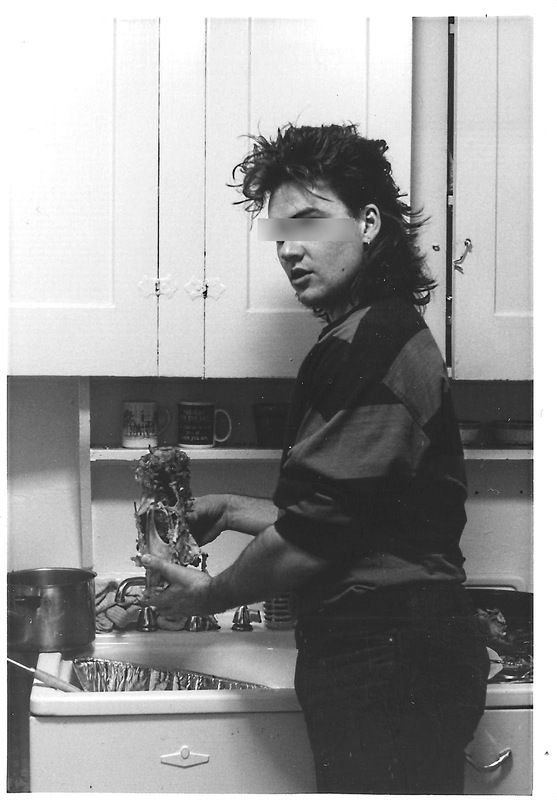 The first turkey I roasted all on my own was Thanksgiving 1986. The roasting took place in a Boston University apartment on Commonwealth Avenue. I don't remember who was there. Perhaps my roommate from Greece. Maybe some other Coal Region ex-pats who didn't make the journey home that holiday. I do remember that I never removed the bag of giblets before roasting. It's not something I would have thought to do. And my mother didn't say, "Oh, hey, by the way - there will be a paper sack full of turkey organs tucked inside the turkey. Remember to removed it before cooking." I mean, I thought the whole idea behind getting someone else to do the slaughtering and disemboweling was so there wouldn't be a moment when you had to handle a turkey liver. Or a heart. I tell her that every time she reminds me of this, I have to pay $100 to a hypnotist to make me forget. Because my mom's turkey filling (or stuffing, don't ever call it dressing) is so delicious that even PETA sends her a waiver, noting that most turkeys are despicable and grumpy and kinda deserve what they get. P.S.Don't tell anyone. And one time, Howard Zinn was drunk at a party and confessed to a co-ed that although he did not celebrate Thanksgiving due to his moral outrage at the general cultural relativism which excuses inexcusable atrocities, he was also a tart for my mom's home cooking. So yeah. Giblets. Eww. But yum. Anyway, this is a photo of the second turkey I roasted - this time, in an apartment on Beacon Hill in Boston, Massachusetts. Well, it's the carcass, anyway. Can you guess what year this might have been? I'm actually surprised that I have a photo that so nearly matches a NaBloPoMo suggestion on such a weird topic. Actually, I'm kinda not surprised. I can't remember who was there?! I know I didn't cook for myself, lol. I think I was just panicking at being responsible for everyone's Thanksgiving. I was one step away from doing the Charlie Brown things and serving toast and popcorn. I never screwed up Thanksgiving, but I did cause severe gastric distress at my first dinner party after I was married by not removing the many, and very spicy, dried chilies from the Kung Pao chicken. It was 1987 so I was wearing leggings. By the hair...1985 or 86. Ah, no. I know for sure it's Beacon Hill. I recognize the sink and cabinets. I lived there senior year with MPC. But you're right, it was 1987! Although...hmmmmm...when *was* JP Thanksgiving? The Thanksgiving meal that started at noon but wasn't ready until 9 at night? Epic Thanksgiving!